*Depending on the marble available at time of production, coloring and shade may vary from picture shown. The original Christus statue by Sculptor Albert Bertel Thorvaldsen (1770-1844) was made of plaster in 1823 and was used to create the 11-foot marble version in 1839 that stands today in the Church of Our Lady in Copenhagen, Denmark. Thorvaldsen spent 40 years in Rome. There he made a sepulchral monument for Pope Pius VII in St. Peter's Cathedral and numerous statues in the style of antiquity. While in Rome he also worked on another one of his masterpieces, “Christ and the 12 Apostles” which made him internationally known as the greatest sculptor of neo-classicism. He returned to Copenhagen where he started and completed his greatest work, the Christus. After Thorvaldsen's death in 1844, the Christus was erected in the Copenhagen Cathedral. This marvelous work of inspired art has now been painstakingly created in exact detail as the original. ** This item can ship internationally via International Priority. Recipient is responsible for all customs, duties, and taxes. Wonderful color! No quality concerns or aesthetic imperfections. I highly recommend this piece for any collection. I ordered a 19" "Marble Christus Statue". I got a plaster statue that's not cleaned very well and still has mold marks on it. It's not worth the money I paid for it. I'm VERY disappointed. I expect more from Deseret Book. This is such a marvelous, beautifully done art piece of the Saviour. It warms my heart when I view it and think of him. I am just giving 3 stars because the statue is NOT made by marble, as advertised, and this is not fair. You can feel the strong resin smell right out of the box. You can even see traces of pressing molding process. So, maybe this is a little bit pricey for not being real marble. But the statue is marvelous. A perfect decoration to remind us (and our guests!) about the Savior. Very Pleased with the Christus Statue. It looks better than the picture of it online. I just had a birthday, and my husband (a nonmember) gave me the 12 inch Christus. It is beautiful, and was a real surprise. He is stunning, and I feel such a sense of peace when you look at him. I really pleased with this statue. And, it lets me know that he knows how important my chuch is to me. Makes a wonderful gift. Firstly, you wouldn't want to get the statue any smaller than the 12". The 12" is nice but still small. I am very happy with my purchase. For me, this item brings the spirit every time I look at it. It helps me make better choices in my home. You won't regret this purchase. Throughout the past 4 years I have purchased 7 of the 19 in versions of the the marble Christus. I have two in my own home and have given away 5. Every time I have presented this beautiful work of art the recipient has cried and commented on how much it meant to them. It really does have a beauty beyond price and a meaning beyond words. Even after having it in my home for so long, I still find myself just sitting and gazing at it. I purchased the 9" version at the City Creek Center location while I was visiting the Salt Lake area last week. It is now the center piece on the mantle above the fire place. 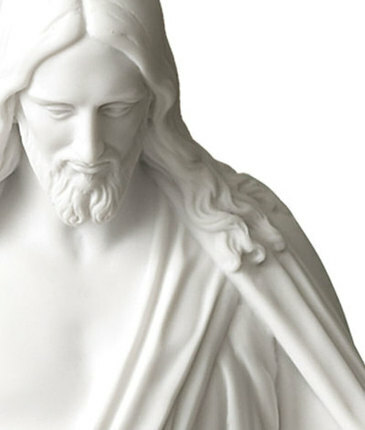 Having the opportunity to see The Christus at The Visitor's Center at Temple Square the day I purchased this makes it even that much more special to my family. I sat looking at the full size statue for probably half an hour, and can say this is a fairly good recreation of that. I also bought two of the 3" versions which are equally remarkable for their size. I was very happy when my copy arrived. I love it! We have had our Christus for a number of years but has stood in our Bishops office until we had our own home. Well, the other day our Great Grandson age 4 came round for the day with his parents who are not members of the Church and we have a lovely contempory painting of the Salt Lake Temple in the same room. Our Grandson looked at the Christus and then pointed to the painting and said to his Granny, 'Does that man live in that house'. What a wonderful moment that was!. A wonderful spirit envelops your home. Our son's beloved wife passed away suddenly, leaving him with a tiny four month old baby. My Husband and I moved in with him to help care for the baby. I brought my Christus Statue as I felt we needed it and for the peace it brings. One morning the baby was restless and seemed to be missing her Mother so I took her over to the Statue which was bathed in the early morning light. The baby literally jumped in my arms and threw her little arms around it like she knew him. The spirit was very strong and I knew she was enveloped in our Savior's love. I told her that her mother was with Jesus now and she seemed to know and was a much calmer child. What a blessing this has been to our family. The statue now sits on my organ under the picture "O Jerusalem" and I feel a special feeling whenever I play hymns of Jesus. Unfortunately, the workmanship is very poor. 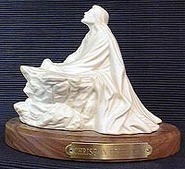 I'm sad to say that the Christus statue we received is not of very good workmanship. It is very yellowish cream colored, not white and the detail work extremely lacking. Extra material from the molding process hangs off the fingers, and the hands barely represent the real statue. We can actually see a seam where it appears the head may have broken off and then been "repaired"--needless to say, I'm very dissappointed. Today our family still enjoys this beautiful art piece in our home. "Christ" is the foundation of our Church and family. that is why the family portrait is directly above the statue. Our grandchildren especially like to stand at look without touching this reminder to be kinder, gentler and happier. Joy is the goal. Best reminder of Christ and the His Atonement. I ordered this statue as a gift for my husband. It makes a beautiful addition to our home and is the centerpiece to our sitting room. Highly recommend!! It is wonderful to have this on display. It reminds me of the D.C. temple. This truely captures the feeling you want in your home, it's amazing!